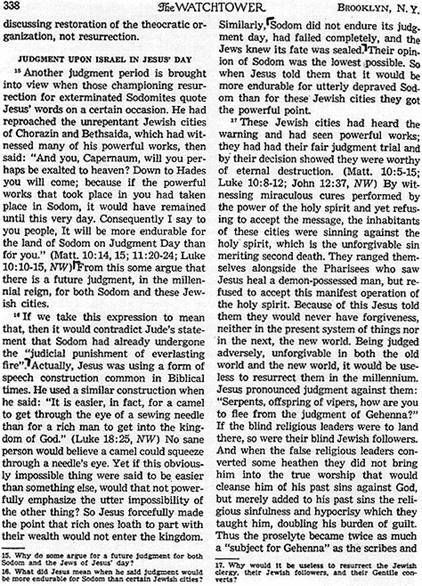 I would like to pinpoint when Watchtower made a dramatic backward editorial change in their 31 year old Insight on the Scriptures, their flagship Bible encyclopedia. Below, number 1 quotes the Insight book as it appeared in the original release back in June 1988. Below, number 2 quotes the Insight book as it appears today -- well, as of a few months ago when I downloaded their WT Library from JW dot org. 2. "Thus, being consigned to Gehenna refers to utter destruction from which no resurrection is possible.—See GEHENNA. Number 1 is from my WT Lib 2013. They apparently made the editorial change (from Sodomites being resurrected to Sodomites not being resurrected) between those two library releases. I don't have WT Libs between those two. If any of you have a tween Lib, please check to see if yours matches either of the above. The Watchtower has constantly changed its stance on whether those des)ed at Sodom and Gomorrah will receive a resurrection or not. This is because two Scriptures present different viewpoints as to the severity of Sodom's destruction. Jude speaks of punishment of everlastingfire, whereas Matthew says those in Sodom would not fare as badly as others will. 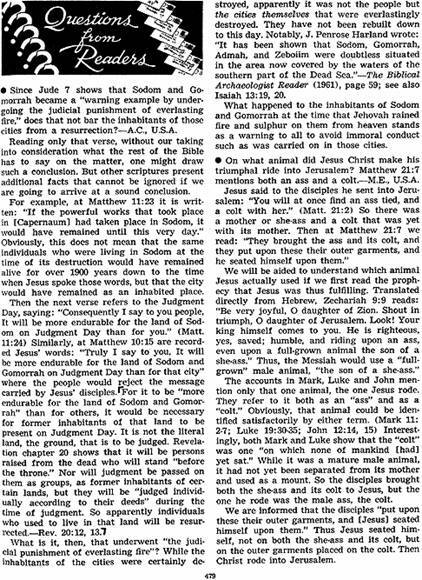 Jude 1:7 So too Sod′om and Go‧mor′rah and the cities about them, after they in the same manner as the foregoing ones had committed fornication excessively and gone out after flesh for unnatural use, are placed before [us] as a [warning] example by undergoing the judicial punishment of everlasting fire. Matthew 10:15 Truly I say to ​YOU, It will be more endurable for the land of Sod′om and Go‧mor′rah on Judgment Day than for that city. Over its history, Watchtower leaders keep reaching different conclusions as to which Scripture should receive the greater emphasis. This removes any confidence that Watchtower leaders have a comprehensive understanding of the Bible's true meaning, and indicates God does not direct them to their doctrinal conclusions. Blondie, I love you! Thank you. Thank you, Blondie. However, I'm sure I didn't make myself clear with my question. I actually want to know WHEN they made the editorial change from my quotation 1 to the quotation 2. It apparently was between the 2013 WT Lib CD and the one I downloaded several months ago. Since I don't have CDs after 2013 I am pleading with ya'll for help in this matter. Again, I apologize for my lack of clarity in my original post. Len, I don't have any CDs after 2015. I would check with Barbara Anderson (posts on JWN--pm?) or check online for her e-mail. I do remember the bouncing around but not the date it was updated. It might have been in 1988 when the Insight books were first printed, or maybe an updated version (mine is 1st edition 1988). • Some adjustments will be made in future printings of the Live Forever book. The only significant change is with regard to the Sodomites, on pages 178 and 179. 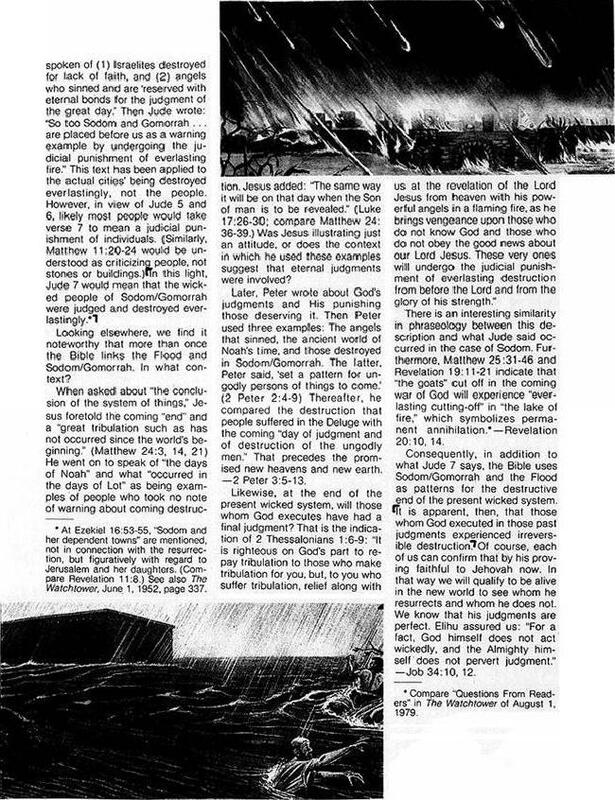 This change appeared in the Revelation book, page 273, and in The Watchtower of June 1, 1988, pages 30 and 31. You may wish to note it in earlier printings that you have on hand. The resurrection or lack thereof of the inhabitants of Sodom & Gomorrah is the #1 winner of JW flip flops. The Holy Spirit just cannot get it straight! The "Insight" volumes were revised twice. First of all, the electronic version was updated in 2015, then last year, the printed version was also updated, and the PDF's of the recomposed books are available on jw.org.